November | 2012 | Afterthoughts & Other Things . . . If I feel entitled, I complain about the deficiencies of different family members. If am thankful, I am grateful that I have a family that loves and cares for me. Am I entitled or thankful? I have to admit that I usually consider myself thankful but if you were to scratch below the surface you would probably find more entitlement that gratitude. I hate that. But the plank is often pretty hard to see. This morning someone pointed out the plank to me. Thom Ranier is the president and CEO of Lifeway Christian Resources. His blog is full of insightful posts that have been helpful to me. This morning’s post was especially helpful. He shines a spotlight on the subtly distinction between entitlement and thankfulness. Give his short post a read and see where you find yourself, thankful or entitled? If I feel entitled, I complain about my job. If I am thankful, I am grateful to have a job. If feel entitled, I complain about the meal I’m eating. If I am thankful, I am grateful to have food on the table. If I feel entitled, I complain that the government does not do enough for me. If I am thankful, I ask what I can first do for others. If I feel entitled, I complain about my spouse. If am thankful, I express gratitude that someone has put up with me all these years. If I feel entitled, I complain about living paycheck to paycheck. If I am thankful, I am grateful simply to have a paycheck. If I feel entitled, I complain about what’s wrong with my church. If I am thankful, I am ever grateful for the freedom to worship. If I feel entitled, I complain about the deficiencies of different family members. If am thankful, I am grateful that I have a family that loves and cares for me. If I feel entitled, I complain about the lousy weather we’re having. If I am thankful, I am grateful to be a free person regardless of the weather. If I feel entitled, I complain to God about why He is treating me so unfairly. If I am thankful, I know that I deserve nothing good, that all gifts are an act of grace. Dear Lord, forgive me for my sense of entitlement. Remind me to rejoice in all things, and in all things to be thankful. Remind me to count my blessings. And remind me when my heart begins to stray from thanksgiving to entitlement. You can find his original post here. You can find idols in the most peculiar places — even in your politics! I found this quote by Tim Keller, pastor at Redeemer Presbyterian Church in NYC. I think he articulates the thoughts I’ve been having about the way Christians approach their politics — the wrongfully place hope that a president, specifically the president of your choice, will calm your worries and make things all well. Enjoy reading this and make sure to leave a comment! Dutch-Canadian philosopher Al Wolters taught that in the biblical view of things, the main problem in life is sin, and the only solution is God and his grace. The alternative to this view is to identify something besides sin as the main problem with the world and something besides God as the main remedy. That demonizes something that is not completely bad, and makes an idol out of something that cannot be the ultimate good. I’ve had a few requests for the points from Sunday’s message re: the comparison between Jesus and Peter. Check them out below. If you have other insights or thoughts I would love to hear them from you!! Leave a comment! Also, if you want to check out the video that I used you can find it here. Jesus and Peter each make a confession or maybe you would say they reply to questions about who they are – three times for each of them. “I am He” – Jesus makes this statement in verses 6 & 8 and makes a very similar statement to Pilate in verse 37. “I am not” – Three times Peter denies the Lord – verses 17, 25, 27. As you read the passage you see that we have two story lines running side by side to each other. Verses 4-ff – Calmness, composed, confident, steady, determined? Verse 33 – Who are you? Verse 25 – Who are you? The final and most important observation is this: that the innocent is condemned while the guilty goes free! Both of our boys participate in our church’s missionary reading program called M&M Kids. Most recently we’ve been reading to Owen the biography of Amy Carmichael. Early in her life, at the age of 20, she learned the lesson of trusting God . . .
Amy Carmichael served in India until she died in 1951 at the age of 83. Her ministry eventually housed and cared for nearly 1000 at-risk children, many of whom where young girls rescued from temple prostitution. She has influence untold thousands I’m sure, included among those are Jim and Elizabeth Elliot. That statement captures my imagination and I wonder what God might do in my life if I learned to trust Him and not confine myself to my weak abilities! May this be found true of our nation once again! 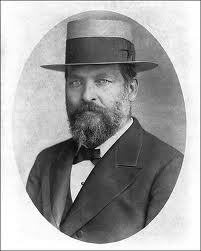 ~~ the 20th President of the United States, James Garfield, who was also a preacher!